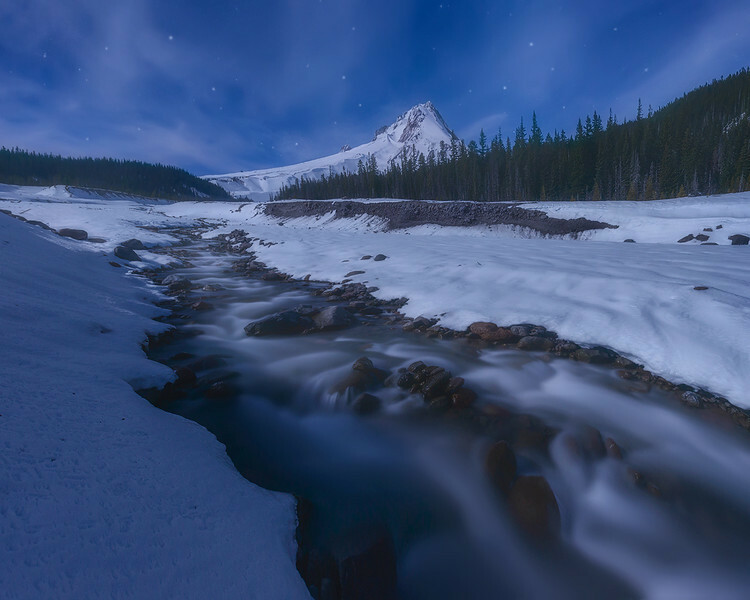 In my opinion this is one of Mount Hood's most under rated vantage points, especially in the winter months. We arrived just after midnight as the rising moon was sitting low in the sky casting shadows and amazing light over most of the landscape. With a tall snow embankment on my left, the moon's light didn't touch the foreground but blazed it's light across the remainder of the landscape. Slight cloud cover gives a nice glow to the stars with Mount Hood looming in the background. When printed full size you can see the snow flakes sparkle in the light, but standing there it almost felt like there were small blinking lights covering the ground. This photo is composed of two shots ( same composition ), 1 at a short exposure time / high ISO to capture the stars without creating star trails. Another shot was taken at lower ISO and longer exposure time to capture the rest of the scene without generating as much noise. These two shots were taken seconds apart to capture what I saw that night. Fresh snow + night skies = Good times!